Motherhood has been hailed as the sole destination of any woman all across the globe. Under the facade of motherhood, all other virtues, qualities or identities, if any, simply slip into anonymity. Rich’s Of Woman Born very subtly exposes the romanticised myths and aura which has been draped around this golden-cage termed “motherhood”. Nancy Chodorow has rightly pointed out that women’s mothering has gained psychological and ideological significance and women, by and large, want to become mothers and get gratification from their mothering. Moreover, women have found it challenging to defy the biological functions of reproduction and construct a discourse to subvert motherhood. 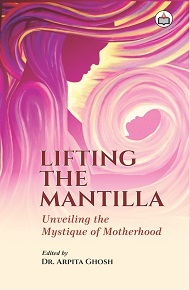 This edition tries to look into the struggles and empowerment of those mothers who showed courage to subvert the social construct and redefine “motherhood” in their own way; mothers who dared to transgress and transcend the threshold of domesticity, thereby, carving a niche for their successors to follow suit. The research papers are related to the concept of “motherhood” with a specific focus on mothers who have transgressed or subverted the societal norms. Previous researchers/academicians have hitherto looked into motherhood from the traditional point of view or reading the nation as a mother or re-visiting the mythical aspects of motherhood. This book surpasses these narrow confines of motherhood to rewrite societies’ definitions and treads new, uncharted terrains as it explores unarticulated angsts and ambitions of motherhood that dare to write their own ‘her-stories’. Dr. Arpita Ghosh is working as an Assistant Professor in the Department of English (PG), Kristu Jayanti College (Autonomous), Bengaluru. She is a gold medalist from St. Xavier’s School, Burdwan for being the best all-rounder student. She has completed her graduation in English (Hons.) from University of Burdwan and completed her MA and PhD in English Literature from Banaras Hindu University, Varanasi. Her several research papers and articles have been published in international and national journals of repute. Her first short story Homecoming has been published in Muse India and her latest short story Granny’s Govind is published in Juggernaut writers’ platform. Her areas of research include Gender Studies, Feminism, Cultural Studies and Geo-criticism. Apart from this, she is passionate about dance, sports and travel.